Quite a few pockets of activity around today for the final day of February. The Maintenance Team were split into two teams. One performed a shunt first thing to position the BSK(K) into Platform 1 for the laying of flooring soon, before proceeding to given attention to sticking doors on W55006. Most of these have been remedied apart from a couple. The other team worked on rebuilding the corridor connection and reinstating the exhaust stacks on E53599. The PW team were around the Cattle Creep changing a cracked fish plate for a new one which has had to be specially fabricated by the supplier. 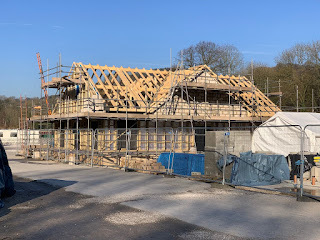 The building is progressing at Wirksworth with the roof almost totally insulted and the doors now installed. Work has also begun on the interior. A duo dismantled the marquee that has been on Platform 1 since May. It is looking a bit bedraggled now! Taking it down is easy, transporting it to the store is hard work. A delegation from the Northants Class 31 Group came to continue nursing 31206 back to health. They were hotly followed by a man in a van who came to provide an initial assessment. Apparently it is indeed possible to grind the crank in situ. Thereafter they turned their attention to checking over 31601. Well as the Monkees once sang it has been "just another pleasant valley Sunday". I'm always hesitant to mention the weather as it's a bit of a cliché. However, it has been unseasonably warm. Volunteers and visitors alike took the opportunity of the good weather to lunch alfresco. A steady stream of passengers gave the railway a real 1950s branch line feel. A lit red paraffin tail lamp also adding to the ambiance. We welcomed Roy and Les Smithurst, at one time much mentioned in these auspicious annals. Especially in the area of platform building. These days taking things a little more easily but still very much full of life. In the yard Joe made further in roads into 55006's return to traffic. It says here that many nuts were tightened.The vehicle was also given a deep clean. Eventually making it onto the last trip to Duffield. Elsewhere the examination 33 103 continued including (but not limited to) inspection of traction motors and generator brushes. The peace of the afternoon tea break was only broken by sounds of rock band Queen on the radio. Together with sightings of a low flying hot air balloon. A generally relaxed day at Derbyshire's favourite branch line with moderate passenger numbers. Interestingly, for the second consecutive Saturday the last Duffield service was our busiest. Down the yard work continued on the Derby lightweight and a few members of associated teams could be found engaged in various tasks. Over at the narrow gauge Ron and Kyle could be found tidying up the miniature railway trackside in between providing a passenger service for our younger guests. Today's service was supported by the station cafe, Association shop and booking office staff. Finally, this evening the railway will host its first special event of the season, 'Ghosts in the Valley'. This must be a supernatural first for a preserved railway and is fully booked. The only spirit I will be entertaining this evening comes in the guise of a single malt! 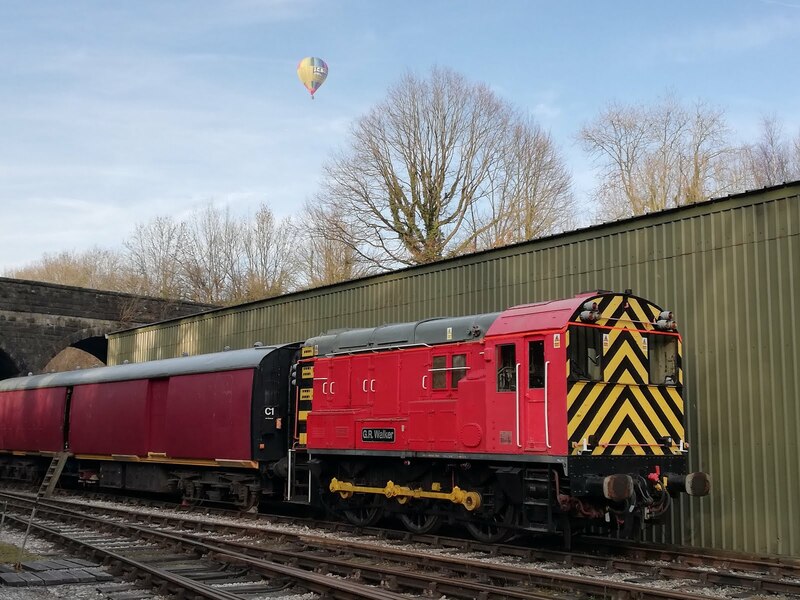 A glorious unseasonably mild day saw our half term Friday service operate, supported by the café, bookshop and train crew. 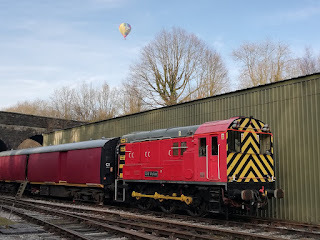 Down the yard, the Class 108 had the glass put back in to the vehicle end windows following the rebuild and Met-Camm 51505 had a leaking toilet tap valve looked at. 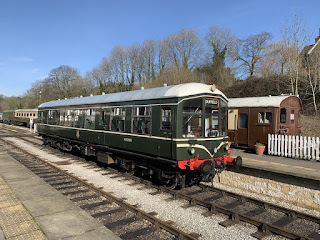 A steadier day in the valley for our first operating Sunday of the season with M79900 'Iris' doing the honors, my thanks go to the Catering, Booking Offices and Train Crew for handling our passengers amicably as always! Down the yard, repairs were being undertaken on the EVRA BSK and further interior restoration work on the Derby Lightweight also continuing a pace. Box van 'Johnny' received a more detailed underframe examination ahead of the Multiple Memories Railcar weekend which found no real issues that couldn't be swiftly rectified. Finally, W55006's No.2 end bogie was re-assembled after the recent vacuum cylinder change and tested once more, and to much relief, the cylinder worked and continued working correctly after many subsequent tests. John and Ben also moved the WiFi receiver on the Conference Room as there appears to have been a building built between it and the station! It was the first day of our new season today. Wirksworth station was the venue for our volunteer open day and and thanks must go to the departments who organised a display in the marquee and played host to the numerous interested visitors. The event has built upon last years success and initial 'sign ups' suggest our efforts have been well rewarded. The Communications Director could be found chasing volunteers for a photograph in readiness for a new issue of identity badges and an updated version of our volunteer's handbook was made available to new volunteers who could also enjoy a trip down the valley and a brief footplate ride on 08 'Graham Walker'. 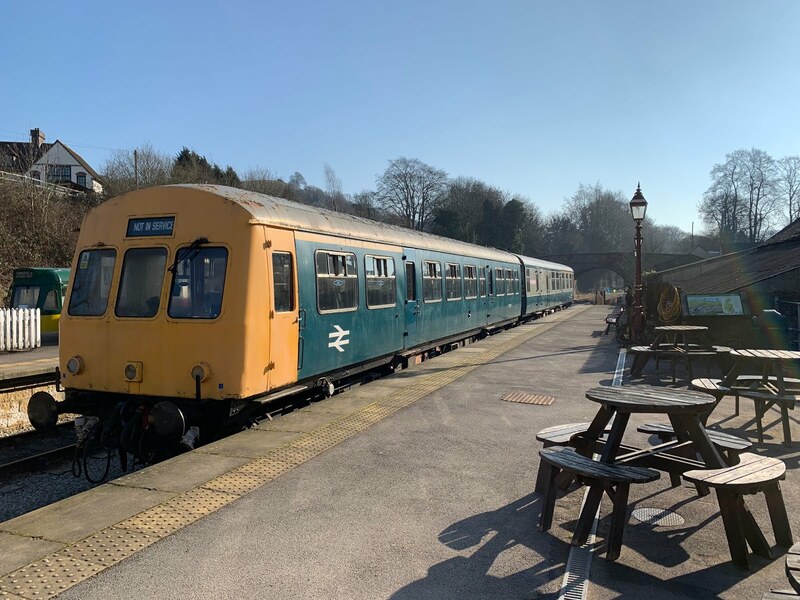 The glorious winter sun helped ensure the two car DMU service to Duffield enjoyed good passenger numbers for this time of year. Interestingly the last train carried a large party of dog walkers who had journeyed the Ecclesbourne way. Down the yard restoration work continued on the Derby Lightweight and 'the Duke'. 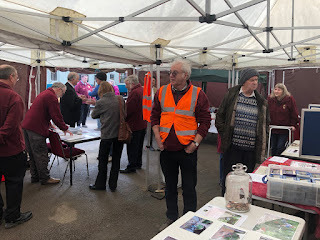 Todays service was supported by the Association shop, station cafe and miniature railway. A very satisfactory start to the season. It would be daring to speak too soon but it really felt like spring was here today. It felt positive to be starting a new season, much in contrast to last year. There was much activity round the station to prepare for tomorrow's volunteering event and get ready for reopening. The Maintenance Team were working on the corridor end scissors for the Class 108. There was a hive of activity on the building site too with some of the roof being constructed in block as a fire wall (and not the type that will stop your trojan).